Today we have a guest post by Jonathan Bluestein; a lengthy excerpt from his book, Research of Martial Arts. Like many of you who practice the Internal arts, I grew tired of magical explanations for how they work, and reading countless books and articles that fail to do them justice. For this very reason, I have written a book titled Research of Martial Arts (www.researchofmartialarts.com). I have spent 5 years working on this project, which has since become an international best-seller, to deliver avid lovers of the arts a real piece of knowledge, which will enrich them and will also be fun to read. Given the immense popularity of the book, I have chosen to release the sample chapter below, spanning no less than 14 pages (or 8500 words), so it would serve to demonstrate what this book is about. The chapter at hand concerns the subject of Yi, or ‘Intention’, which I believe is found at the heart of what the Internal arts are and how they are practiced. Do keep in mind that this chapter begins on page 71 of the book (of 418), and is preceded by quite a lot of information. It merely serves to explain one component (albeit major) out of many that exist in the practice of the Internal arts. It is also provided to readers in the context of comparing ‘External’ and ‘Internal’ methods of training. Please forgive me and kind blog owner Mr. Matz for the occasional awkward text and image alignments. The conversion of this chapter from an orderly book format to a blog article has proved challenging. There is a point between thinking of doing something, and actually doing it. Say a heavy object is falling down from above me, and I want to catch it. My mind has already decided to do so. Right before I catch that object, my body is aligned in the best way it knows to catch the falling object. I unconsciously use my Intention to fill out that empty shell that is my body, to support it in catching the falling object. Was I to stand there with my hands up in the air without anything falling, the feeling would be different. Yet, when I have the Intention of doing a physical action (in this case - catching something that is about to fall on my head), I am much more likely to succeed in doing it, and my body reacts in a different manner. Such is the concept of Intention, or Yi [which is also sometimes referred to as the "mind-muscle link (connection)" (15, 98) by Western martial artists and bodybuilders, who also use the same concept, albeit in a different manner(177)]. The Internalist wishes that eventually, whenever doing any martial movements, either in training or fighting, his body would have the automatic intention to support his or her structure for the desired action. The Intention creates the correct initial firing of nerves, muscle-sensory organs, muscle fibers, tendons and fasciae**; it keeps our body slightly alert to the possibility that a certain action (like catching a falling object) is about to occur. Yi is thus used to create a constant "ready" state of mind and body when in a physical confrontation (similarly to the mental concept of Zanshin in Japanese traditional martial arts). Yet among Internalists, this physical "readiness" is gentle, sometimes unseen altogether, and is characterized by alert relaxation rather than overt expectancy. It is like the Venus Fly Trap calmly awaiting a fly, rather than a tennis player anxiously waiting for the other player to serve the ball; more in the lines of a semi-meditated violinist keeping his gentle touch on his instrument, waiting for the conductor's slightest move, than an agitated policeman getting ready to jump protestors. A. Standing in Zhan Zhuang (Pole Postures): The practice of Zhan Zhuang hides vast internal sophistication within a simple-looking external shape(80). Because of this, it is often not practiced enough, or neglected altogether, even by Internalists. These are ‘static-looking’ postures held for long durations of time - from a few minutes and up to two hours. These postures are sometimes ‘generic’, in the sense that they have connections to many other movements in the system, and often do not specifically mimic the shape of a single move or application. The shape of the posture has to be functional for the martial art one is training in. Had someone wished to practice a Zhan Zhuang posture suitable for the sport of American Football, for example, he might have held a stance that would look similar to pushing an imaginary opponent in mid-running, say during a tackle. Internalists use postures that are related to the structure and movements they tend to utilize in combat. This connection between Zhan Zhuang and combat applicability is not always obvious to the naked eye of the common observer, yet is nonetheless existent among serious Internalists. In the picture: My teacher Nitzan, demonstrating a basic Zhan Zhuang posture, nowadays common in many Internally-oriented schools, called Hun Yuan ("Smooth Roundness"浑圆). It is a non-combative posture, which can be used to generally develop one's Internally-oriented structure and Yi (that may in themselves be used in fighting), or for health-maintenance. When first beginning to practice Zhan Zhuang, the practitioner learns how to loosen his muscles through the pain of standing still, and using ‘core muscles’ and the fasciae to support his structure instead, with minimal tension (I will discuss the fasciae and what they are in great detail as this chapter progresses). Over the course of the first few months, one may tremble and shake, as the muscles over-react to the pressure of holding a fixed stance for a long time. This will cease once basic overall physical relaxation has been established. Later, it might feel like there is some numbness in the limbs, and/or like a faint energy flow, sometimes warm and/or tingling(156), p.19. Those are just the senses messing with the brain, nothing more, yet they indicate the buildup of better Intention and loosening of the muscles, which allows for better blood flow. At this stage, the practice is still almost purely static (no posture is truly static(101), and the body trembles and moves on a small scale all the time, even if you remain in place and no longer feel like you are shaking). One will traditionally persist in this 'static' stage until he or she had reached a point when they can stand very comfortably for many minutes on end (the number of minutes invested in practice will depend on the training goals of the practitioner). Another important distinction between this stage and the ones that shall follow it is that in this stage, one strives to use the least amount of muscular action necessary to maintain oneself statically in place; which in turn means that at this stage, Zhan Zhuang are still not a "whole-body exercise". After that stage is clear, through expert guidance, one will start using imageries of external actions to pump intention into his structure(95, 96) – the point at which the "Yi kicks in". This is not mere guided imagery or motor-imagery*, but a solid kinesthetic experience. It strives to become more "tangible" than just using imagination as an aiding tool, as done in Ideokinesis. The Intention can be felt, because it creates a slight tension in the sensors-receptors which sit within our muscles, tendons and fasciae**, signaling the muscle is ready to act in the movement vectors focused on. In the beginning, one will only try to "feel" the imageries, but not "manipulate" them. Afterwards, the practitioner will learn how to very gently contract muscles in varied vectors, as if he or she were supporting an outside force coming from many directions, or forces pushing on their limbs from the inside. This greatly increases muscular awareness. It works upon and improves one's ability to utilize muscular stretch-reflexes*** with the entire body at once(156), p.103, and prevent antagonist muscles from interfering with each-other's actions. Unlike with large-scale utilizations of the stretch-reflex in exercises such as rope-jumping and bench-pressing, the muscular contractions exercised with Zhan Zhuang are very small, and one seeks to make them smaller over time95, eventually virtually invisible to the naked eye. Over the course of months and years, more and more imageries are added and refined, until the whole body responds and supports itself like one single-charged spring-like unit (on this "springiness" I shall dwell heavily later down this chapter, when discussing the concept of "Tensegrity"). At this stage and throughout those that follow, the practice appears to be static, but is highly dynamic and full of movement on the inside. It is like with a skilled circus performer balancing while standing on a rope – at times, he doesn't seem to be moving much, if at all, but a lot is going on within his body as he intuitively uses Yi to maintain the balance (I borrowed this analogy from Caylor Adkins(87)). The imagries used to train the Yi are most commonly, as explained, of forces pushing, pulling, tearing, converging, expanding, condensing, etc. on various parts of the body, from all sorts of angles. Other imagries might be of performing actual movements while remaining in place, as in Ideokinesis. Both methods are used to train the structure in conjunction with the Yi. As the Yi provides a stimulus for the muscle-receptors** to act upon with minute dynamic stretching within the body, one wishes to have the body react as it were trying to initiate an appropriate response, with all the parts interconnected. The imagery of the fingers trying to push outwards would also affect the heels. The pushing inwards of the elbow will affect the knee; etc. This is the logic by which one uses the Yi to train the whole-body unity of the Internalists' structure, as applied to Zhan Zhuang and other methods that shall be discussed further into this chapter. When training the Yi, no one part of the body is working solo. While the muscular contractions now make Zhan Zhuang into a whole-body exercise, the purpose is not training the muscles to become bigger, stronger or more endurance-tolerant, but building a unified structure, which is both relaxed and alert. Therefore, right from the beginning stages, excessive tension is discouraged and gotten rid of. The difference from earlier stages is that the practice now becomes active, after previously having been mostly passive, and involves the use of Yi and more of the body's muscles and nervous system's functions. The training of Yi can reach higher levels. As control over one's muscles becomes still more refined, various types of imageries can be used to enhance the level of relaxation one's structure is capable of. Wherein in the first stage, relaxation was acquired passively, later on in one's training, the Yi could be used to take this aspect a step further, via active manipulation of the will. 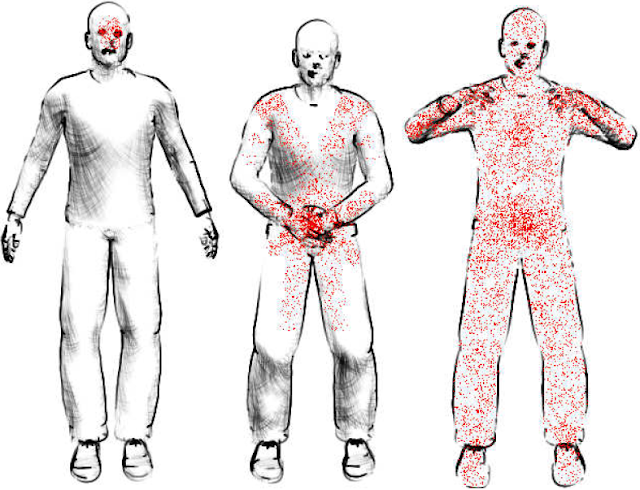 Other forms of Yi usage are related to advanced manipulations of the body from within, affecting tissues and joints in ways uncommon to ordinary people. The tendons, too, are exercised in special ways, by using the Yi to stretch them at key points, while maintaining relative muscular relaxation. Within some lineages, in yet more advanced levels of Zhan Zhuang practice, combined methods of Neuro-Linguistic Programming (NLP) and self-hypnosis are used to refine the mindset of the practitioner for combat situations, sharpening one's audacity and mental preparedness for physical conflict. Alternatively, some would meditate while training their Zhan Zhuang. Such techniques probably did not originate from martial arts, but were incorporated into them from religious and philosophical traditions, such as those of Buddhism, Daoism and Hinduism. Following these stages, and parallel to the refinement of the above mentioned bodily-skills, the practice contains the potential to transcend the flesh, and become almost completely mental. This goes beyond what most people achieve in their training. Most people don't even know how to train the Yi. The latter individuals, as well as those who do train the Yi consciously, are chiefly focused on training physical aspect of their bodies – changing the way their muscular and nervous systems work. By physical training, one could gradually alter the way the mind works. This higher level of Yi training I write of has the nature of trying to directly work on the mind (as in regular meditation), while training physical aspects in parallel. It could be likened to the mental effort of trying to meditate while slowly riding a bicycle on mountainous terrain. One would have to have become exceptionally accustomed to his practice on the bicycle to be able to meditate with pronounced success while riding them and also working on the improvement of his or her riding skills. That is why I consider these techniques to be higher level skills (compared to other training methods utilizing Zhan Zhuang). The highest level of training one's Yi in the Internally-oriented arts, has been referred to in the Xing Yi Quan classics as: "A fist without a fist, intention without intention – within the absence of Intention, lays the true Intention". My teacher Nitzan explained to me in the past that there might be several interpretations for that sentence. The first interpretation is that one should be capable of issuing a technique without any intention on his behalf, as a response to an external stimulus. Then, when the technique is delivered without any intention or conscious thought, this could be deemed the "true Intention". The second take on it, is that this sentence describes a state in which the practitioner can release power at any angle, without even changing the external shape or position of his or her body. Without movement, there is no desire or need, no expectation or wish of self-gain by the Ego; only a modest feeling of satisfaction and personal fulfillment. A third way of thinking of that sentence is that it illustrates the state in which the practitioner's movements are completely "taken over" and "led" by the Yi, and he or she feel as their body simply "moves on its own", without any conscious effort on their part. Not all types of Zhan Zhuang are directly related to combat applicability. Some, while still having a connection to martial training, may specifically emphasize mental-physical relaxation or health promotion. One example is, of course, the Hun Yuan posture as seen in the picture I have included before. 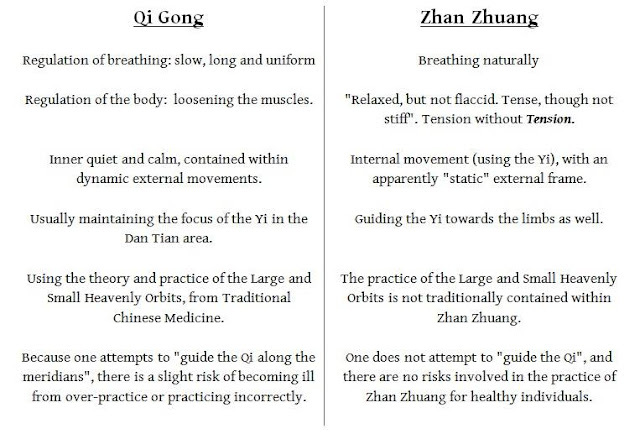 Combative Zhan Zhuang may also be practiced with these goals (of attaining better health and relaxation) in mind. When trained in this relaxation/health oriented fashion, the Yi might not be as intense, and stances will be held in higher positions, to ease the load on one's legs. There are even Zhan Zhuang that border in their function, between Yi training tools and advanced methods of stretching (Wuji Zhuang and Zi Wu Zhuang are good examples for such stances from the Xing Yi Quan I was taught). Nonetheless, all Zhan Zhuang, regardless of function, are used to train the Yi and instill correct structural alignment. In the pictures: Drawings made by my teacher Nitzan, in order to try and further explain the concept of Yi. The one on the left illustrates a person who does not commonly use the Yi – that is, most people around the world. For such a person, awareness of his own Yi is very limited. The person on the right is an Internalist adept, practicing the Hun Yuan variation of Zhan Zhuang. This person uses the Yi to engage and be aware of his whole body. The middle figure is the same Internalist adept shown on the right, after finishing his Zhan Zhuang practice. He places is palm above the Dan Tian area, and focuses his intention into that area, feeling the heat, energy and flow generated while he was practicing earlier being diverted right into his Dan Tian. Of the Dan Tian and its qualities I shall explain later. Another way to look at the matter would be through shifu Mark Small’s interpretation. He defined(193), p.40 ‘Nei Gong’ (Zhan Zhuang included) simply as “Qi Gong intended for martial purposes”. The Internalists' martial Zhan Zhuang's are not the same as the static stances held by Externalists. The latter are used to build muscle stamina and stability in holding a specific stance, and the former for other purposes as described above and further down this chapter. Also, while in Zhan Zhuang, one aims to loosen the muscles and use a minimum of muscle tension as key for progress in them and in one's art in general. There aren't many Externalists who abide by this thinking. Late master Feng Zhiqiang, of Xin Yi Hun Yuan Taiji Quan, had spoken about it from his perspective in simple terms(57):"…I learnt and practiced Standing Post exercises of Shaolin schools. The main difference between them and the methods of Neijia schools is that Neijia emphasizes relaxation to greater degree. For this I think there is certain reason in dividing martial arts into External and Internal Families…". Master Lu Shengli remarked(67) that: "In most martial arts, the goal is to increase power.In Taiji Quan you should constantly be asking yourself how to reduce your force and still win". Furthermore, observing External stance-holding practices reveal that they primarily use the few specific muscles that support their structure. Squatting in a low stance with the hands held in air, for example, would normally primarily engage the Quadriceps (leg-muscles) and Anterior Deltoids (shoulder-muscles). Many other muscles will work as well to contribute and stabilize the stance, but these two muscle groups will be explicitly much more dominant (and also the first to fatigue). The Internalists' Zhan Zhuang, on the other hand, are a whole-body exercise (this will be addressed thoroughly later on in this chapter). Once intention is added to the initial static practice, the entire body begins to fluctuate and vibrate in accordance to rapid-consecutive changes in tiny muscular movements. What people think of as static is actually very much alive and vibrant in the Internalists' case. On the small movement-scale that is associated with Zhan Zhuang, the movements are also incredibly fast. These movements are often contained within the range of less than 1cm from one point to another, and are to be measured in milliseconds. One might call it "Internal Plyometrics" (borrowing a term coined by Steve Morris in one of his articles(84), which he used for a similar training concept). There exists some criticism as to the nature of the tiny movements trained with Zhan Zhuang. People who dislike this practice have argued that a fight cannot be won by standing in one place, let alone moving in such a minimalistic fashion. This is based on misunderstanding of the role Zhan Zhuang play in the training regime of Internalists. They serve to develop proper whole-body unity, relaxation, and sensitivity – attributes of the Internalists' structure. They do not (physically) simulate a fighting scenario, but constitute the structure that will be used in fighting. They do contribute to another skill which is directly related to combat - the capacity to efficiently initiate a swift attack from a (near) static state. A common weakness among marital artists is that they "telegraph" their movements. It is very hard to initiate a powerful attack from a static-state without showing it beforehand. Mentally, one feels he needs to "get ready", and exposes his intentions. Physically, one usually needs to gain momentum with some large movement(174) p.40, to create the power-generation potential. The type of movements trained "within" Zhan Zhuang are inherently adapted to solve this problem. They mimic the first milliseconds of movement when one initiates an attack or defense, and specifically focus on them. While not being actual "techniques", they create the structural body-mechanics which support them. One can then flow into a new movement without signaling the other party that he or she are about to do so. The practice of Zhan Zhuang predates modern martial arts, and was polished over and over for thousands of years in China, before reaching its current sophistication. One of the earliest records of it was probably in the Yellow Emperor's Book of Internal Medicine(36): "I've heard that in ancient times, the wise lived by the Dao. They supported the Heaven and Earth, had a grasp of the principles of Yin and Yang, breathed the essence of the air, stood still and gazed upon their spirit, and their muscles were united as one." Ellis Amdur argues35 that the principles laid by Zhan Zhuang occur naturally, and are discovered in non-martial-arts environments and scenarios as well: "…Consider an Inuit hunter, required to stand motionless beside a seal-hole for hours, because the slightest movement would scare the seal away. He will learn to stand with efficient relaxation, ready to move instantly despite hours of immobility in the cold air…". It is unclear when exactly Zhan Zhuang were adopted as an integral part of martial arts training. Holding martial postures statically for minutes on end was probably common even in ancient times, but this cannot be claimed of the more sophisticated Zhan Zhuang practices I have written of. Xing Yi Quan is the art most notable for its use of Zhan Zhuang (together with Yi Quan, its historical off-shoot, created by Wang Xiangzhai). The use of Zhan Zhuang in Xing Yi only dates back as far as the middle 19th century, to the time of its founder, Li Luoneng. 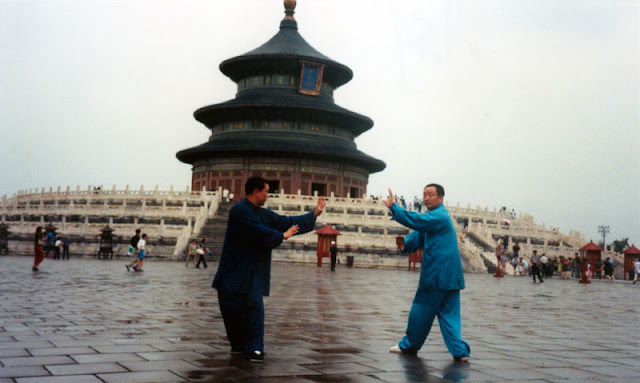 Other arts like Bagua Zhang and Taiji Quan have adopted this practice even later in history. Bagua, as a martial art, can only be traced back to the time of its supposed founder, Dong Haichuan, who lived roughly in parallel to Li Luoneng, the founder of modern Xing Yi Quan. The use of Zhan Zhuang in Bagua could probably only be traced back to Dong's students, as we can only vaguely tell how Dong practiced the art himself, because each of his students came up with a different version of Bagua, based on his own skillset and understanding. With regard to Taiji Quan, implementation of Zhan Zhuang was made much later. Reference for Zhan Zhuang cannot be found in any classical Taiji Quan texts, or seen in training pictures or video footage or masters from most of the 20th century. Together with Zhao Bao village Taiji Quan, Chen style Taiji is considered the most ancient of Taiji styles, and most other Taiji styles today claim to have historically originated from it. Chen style was developed in Chen village in Henan province, China. In the interview I conducted with master Chen Zhonghua (found in Part III of this book), who is a Chen style teacher, master Chen has suggested that Zhan Zhuang practice had only reached Chen village in the 1980s. Other arts were further influenced by the practice of Zhan Zhuang as found in Xing Yi and Bagua, and adopted similar methods in the late 20th century to early 21th century. The Hun Yuan posture and its variants have especially become very common in various martial arts – probably because they are relatively the easiest Zhan Zhuang methods to practice, and the most suitable for those interested in practicing for health preservation. As for other arts that include some form of Zhan Zhuang training and postures which are uniquely their own (like Baji Quan and Jingang Bashi) – I did not manage to find where their methods had originated from. B. Trying to "feel" or "test" the power/resistance (called Mō Jלn 摸劲 or Shi Li 試力 in Mandarin Chinese): Referred to as Zhan Zhuang in motion (行桩 Xing Zhuang – ‘Moving Standing’); doing general motions related to the movements in the style over and over again, slowly, and trying to use intention to feel the resistance that might be applied by an adversary, so the body can learn how to support itself against that kind of resistance. This type of practice had probably existed within martial arts long before Zhan Zhuang were adopted. In the picture: Liu He Ba Fa practitioner Yun Yinsen demonstrates moving while feeling resistance. As explained before, the motions done for power feeling and Zhan Zhuang postures might not have direct martial applications. They are primarily used to develop gong fu. Another byproduct of doing them is heightened sensitivity to touch (Ting Jin in Mandarin Chinese – "Listening Power"), with the Yi learning to adjust automatically to varying pressures. This poses an advantage for the Internalist, as it allows one to develop his/her sensitivity to touch to a great extent without relying on a live partner to work with. This is not to suggest that one shouldn't train with other people – on the contrary. Human touch is very important so one can literally grasp the correct feel he will afterwards train by himself using his Yi, and remain in-touch with the reality of a living, opposing opponent. Many do not have the privilege of having another person to train with on a regular basis, or are limited to training with others during lessons, at best. Correct use of Yi can compensate for this handicap, and may even prove to be superior in the sense that it can be practiced extremely slowly (to refine one's skill), unlike when people cross hands, in which case slow is rarely the way they go about doing things (as ego responds faster than logic). Shi Li could be compared to the practice of "shadow boxing" in Western Boxing, in the sense that both are used to "feel the opponent" without any actual opponent present. Not all Internalists would use Shi Li in the same manner as Shadow Boxing. Shi Li could be performed either with repetition of the same movement over and over, or randomly floating from one form of Shi Li movement to another. Many Internalists argue that trying to imagine an opponent is counter-productive as it sets fixed response patterns, while using the Yi without imagining an opponent gives one a more general "feel", which is not fixated on certain movements or techniques. An Externalist might not have any trouble with giving-in to "fixated response patterns"; on the contrary – sometimes, this is what is meant to be achieved in his training. Externalists who engage in sports competition often train for a match against a specific opponent, and augment their training to help them develop the techniques and strategies suitable to defeat that particular opponent. Therefore, such fighters have an interest in setting fixated response patterns that will take advantage of their adversary's weaknesses. These are carried over to shaow-boxing practice, including active imagination of struggling with that opponent. This is in sharp contrast to someone who is training for either self-defense or non-sportive combat. In these situations, violence occurs without preparation, and so it is more important to "be ready for everything", and not become as fixated as a competitive fighting athlete. Another strong difference that I had already mentioned is that Shi Li, like Zhan Zhuang, is primarily used to develop the structure, the Yi, and the movement principles. While Shadow Boxing too is helpful in developing the Externalist's structure, it is not its goal of that training method. This is also reflected in how these two methods are practiced – with Shi Li usually practiced at a slow pace to gain foundations, and Shadow Boxing mostly at high speeds, to simulate real combat. The order of training among many Internalists is as follows: At first, the correct feeling of Yi is taught by practicing Zhan Zhuang (Though many teachers have been known to skip this stage in their curriculum, or only teach it to students at later stages. Some simply do not teach Zhan Zhuang at all). The practitioner becomes increasingly aware of advanced physical alignments, using the Yi to manipulate one's structure from the inside. Later, Shi Li practice helps one develop it further(80, 97), and maintain the right feeling and body alignment while moving. These methods are then reinforced by learning how to correctly engage in physical contact – not necessarily in the way of fighting-applications, but by learning correct movement principles. At last, the skill naturally expresses itself within the entire spectrum of movements available within the art. This trait is unique to the Internalists. Because of this, Zhan Zhuang and Shi Li are what I have termed earlier in the book as Structure Essentials: the core training methods of the arts which utilize them, which are the most important. It is sometimes said among Internalists that Zhan Zhuang are used to "develop the power", and Shi Li to learn to "move the power". In this sense, the "power" is the overwhelming nature of the Yi, which encompasses the entire body. The aim of the Internalist is to reach a state wherein every movement practiced contains Yi automatically, even without thinking about it(55, 56) – a return to a subconscious state of mind, wherein the Yi is omnipresent. Like I have written before, this allows for the development of zero reaction time to touch. There are no more gaps between thought and action – things already happen as you think of them, or even before conscious thought have settled. This mirrors Taiji Quan's classic writings: "If the opponent does not move, then I do not move. At the opponent's slightest move, I move first". It is a part of what Caylor Adkins has reffered87 to as "having the critical edge in combat". As the Yi is ready to "fire" in any direction, one's movement is never too committed. A punch thrown already has the "intention" of re-directing itself into a sideways blow, and a kick can instantly turn into a stomp. No movement is bound entirely for one ultimate path. Non Internally-oriented arts sometimes make use of the opposite strategy. A Muay Thai round-house kick, for example, often causes the entire bodyweight of the kicker to move into the strike uncontrollably, to cause maximal damage to the opponent. When such a strike misses, the fighter is forced to make a 360 degree turn because of the momentum he himself created. This is never put to practice among Internalists. A Muay Thai fighter, being a sportsman, is not concerned with the opponent attacking him from the back as he turns, in a non-sportive manner. The Internally-oriented arts were originally developed by people who were not sportsmen, and were therefore concerned with urban or battlefield combat, in which losing control over a movement for a fraction of a second or turning your back to the opponent could cost one his or her life. In principle, any movement can be practiced very slowly and with a lot of Yi and be used as Shi Li training; However, Internalists tend to focus on the general movement patterns that are most relevant for developing the style's distinct body-method. In Taiji Quan and Liu He Ba Fa, the long practice forms (which are usually, though not always, practiced at slow speeds) are used as Shi Li training(2, 28, 55), while in Bagua, this is emphasized when walking the circle(1) or performing linear forms. 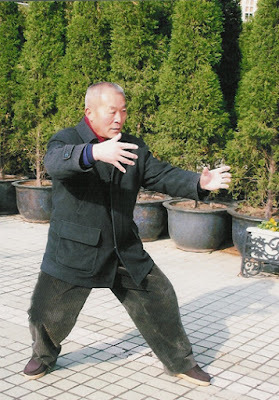 A few Taiji Quan lineages (such as master Wu Tunan's lineage) combine the practices of Shi Li and Zhan Zhuang – one executes the long training form, and stops in every posture for a short period of time, holding that posture as Zhan Zhuang. Chen Taiji Quan lineages in particular feature a type of Shi Li exercise called "Silk-Reeling", which will be discussed later in this chapter. The terms "Mō Jלn" and "Shi Li" actually come from schools of Xing Yi and Da Cheng Quan (respectively). In these schools, Shi Li is a separate practice, which is specifically designed to develop correct Yi. One might ask: how is it that some Internally-oriented schools refrain from training Zhan Zhuang, yet still maintain the "Internally-oriented" classification, and succeed in developing "Internal Skills"? The answer lies in the nature of Shi Li training. As suggested before, Shi Li is actually "Zhan Zhuang done with large motions". In that sense, Shi Li training can compensate for lack of Zhan Zhuang for the most part. Zhan Zhuang are basically a shortcut for achieving some of the skills developed with Shi Li. They have the potential to save a practitioner years of hard work of refining his/her skills, but one could still manage to advance these skills without them. Unlike other forms of "energy work" pushed by new-age charlatans, Yi is therefore a biological by-product of the sensors in one's muscles, and can be physically felt within a few months under the tutoring of a good teacher, and sometimes even sooner considering one is talented, and his practice is diligent and sincere. The awareness to Yi and control of it are to be gradually and naturally understood through practice under proper guidance. The advent of this remarkable training method should be the feeling of warmth in one's limbs which eventually, month-by-month, reaches the extremities – the tips of the fingers. After a concrete feeling of heat is established in the extremities, and Yi can be automatically ‘activated’, it gradually travels back into one's center of mass, until the whole body feels heated. 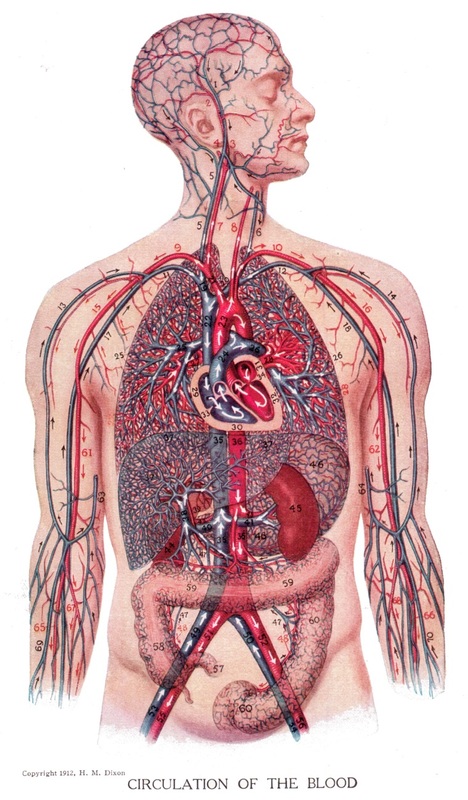 This warm, calm, comforting sensation stems from first loosening up the muscles and joints, allowing better for blood flow, and then consciously learning to govern this blood flow by stimulating the muscle-sensors, as the practitioner is trying to feel resistance pushing on him from varied directions, and using other advanced methods of moving his internal workings. A phenomenon that should be observed by all Internalists is a change in their palm's colour (in practice). A pale person for example, would see a change from white to dark red or dark purple, as a result of blood buildup in practice when control over one's Yi gradually becomes stronger (colour changes depend on one's natural skin colour, and so different individuals will experience different color transformations). The above mentioned phenomenon are more commonly noticed during the winter, when the cold weather contrasts our body's naturally-generated heat. Considering one is well-dressed during wintertime, good internal practice will result in the body keeping very warm, even without moving quickly or with large motions. The use of Yi can also heat the body without a substantial increase in one's heart rate. Besides the feeling of "warmth", other types of physical sensations that stem from training the Yi will vary between different individuals. I personally feel as there are magnets connected to many parts of my body, with the resistance between these "invisible magnets" leading my movements to a greater extent and precision as my skill progresses. Bagua master Ma Chuanxu has described58 the process in this manner: "Once Neigong develops, it is like electricity in hands...The Intent becomes important. Intent drives Qi and Qi drives Strength (Yi Dai Qi, Qi Dai Li)...". When "turning on" the Intention with the whole body after being "intentionless" and relaxed, it might feel like the body is a large, thick gardening hose being filled quickly with water. The attempt at multi-directional sensory experience with the Yi is often compared to "swimming in the air", for the Internalist materializes sensations that are akin to performing his movements while inside a swimming pool. I hypothesize that the differences in how people describe their sensations of Yi have to do with the preconceptions practitioners put into their practice. I feel "magnets" because I liked to play with magnets as a child, and have strong kinesthetical memory of them. Another person, who may have not been exposed to magnets like I did, might actually feel something very close to what I am feeling, but will choose an entirely different way of describing it. For this reason, my teacher Nitzan and other teachers have always been cautious not to tell their students what they were "ought to feel". Another important reason for this same decision is that sensations should only be the outcome of training the Yi, not the aim. "Chasing" after the physical sensations that the Yi creates may cause one to feel good, but will not manifest the correct structure for the art. As a higher level of skill develops, the Yi may seemingly take over the physical body from time to time, especially in solo practice. The motions physically feel like they are being done by themselves – as there is an invisible force pulling on the body in the correct way. The body feels like a leaf carried by nimble warm winds, which seem to direct it in very specific vectors and angles. It is important to emphasize that "the sensation of no-effort in action is present not at no-work but at correctly co-ordinated work" (140); meaning that it is not by limping relaxation that effortlessness is achieved, but by correct and alert usage of the Yi, that one has grown accustomed to. Mentally, it seems that the consciousness becomes a mere sideways observer, while simultaneously being very much aware and alert to everything that is happening. A sort of naturally self-imposed semi-trance state. This phenomenon has been described by a few Taiji exponents whose books and articles I have read, but I have also felt it myself in practice to a lesser extent. I believe that mentally (yet not physically), this state is identical to what an veteran car driver experiences when he drives long distances in familiar roads. The driving of the vehicle is shifted into an "auto-pilot" mode, and the thinking brain can either focus on other things (like beautiful girls on road-signs) or just float mindlessly (this I have also felt through experience in driving, so I can make the comparison). Because attention is then freed from constant monitoring of one's movement, most of it can be directed elsewhere – say more towards what the opponent is doing. A testimony to the physical manifestation of the Yi can be strongly felt by any Internalist who has succeeded in initiating its use (this should, as explained, occur early on in one's training). Once incorporated into practice, it changes the way the body reacts to training. It draws the energy out of you in a strange way. I have had experience practicing many Externally-oriented methods: those of Weight Training, Gymnastics, Western Boxing, Okinawan Karate and Pigua Zhang. What all of these have in common is that after strenuous practice, you are tired in the sense that your muscles are fatigued, and your body has less strength. After a prolonged training session with Internal Methods, however, the feeling is different. Regardless of the apparent physical difficulty, it is your mind, not your muscles, which gets to you. In those days when training was particularly smooth and deep, one could end a training session in an Internally-oriented art not because of muscular fatigue, but because he feels the burden of the mind "weighing in" on him. It feels like he has been reading for several hours, and now his mind yearns for some rest. The great mental effort by the brain to maintain the physical and mental omnipresence of the Yi, in both the mind and muscles, can prove challenging during the first few years, when this process is still forced, rather than natural. It is quite literally a mental workout no less than a physical one. This is the result of what scientists have long called "Deliberate Practice" (179) – a kind of practice which is full of attention and introspection, unlike simply 'going through the motions' mindlessly. The importance of Deliberate Practice cannot be underestimated, as it has been scientifically proven to be a key factor in the development of long-term high-end skill levels (in any sort of practice, not just martial arts). In his book(28), Chen Taiji master Jan Silberstorff makes a joke upon his own experiences, telling the reader how he participated and won 20 Taiji form competitions, where he went on to put a show of magnificent flowing movements, which were actually lacking true depth and skill. While master Jan admittedly now realizes he did not know what he was doing at the time, since he had won, he figures the judges did not know much either. It was only later, under the guidance of his teacher, Master Chen Xiaowang, that he filled his "empty forms" with "content". This so called "content" being the use of real Intention, and the specialized body-mechanics of the Internalists, that will be discussed later in this chapter. Taiji Master Dr. Yang Jwing-Ming also uttered(52) his disappointment of the common scenario of people failing to grasp the deeper notions of Internal practices, such as training the Yi: "…They (people who've practiced for many years) don't understand the deep aspect of the martial arts. All those things that they see are the forms. Like for example, take taijiquan. The taijiquan they see so far is forms. What is the essence behind the forms? What is the internal side of taiji? Very few people know…". Taiji master Chen Zhonghua have similarly remarked(80): "Most people practice with limited capabilities of self-observation. Their training may result in development of muscles, ligaments and other types of normal power. Yet these activities for stretching the joints, with merely mechanical movement and rotations, will not give the learner any feedback which would be useful for development of skills of Taiji quan. Such practice will not cultivate the unique requirements for Gong (skill) in Taiji practice". The concept of Intention is often misunderstood in the west because of a cultural-lingual barrier. When western martial arts teachers talk about "having the correct intentions behind your technique", what they usually mean is one should commit themselves mentally to applying their techniques to the maximum, without fear of consequences at that particular moment. The Chinese, however, make a distinction between one "intention" to another. A person with the mental intention described earlier would be considered to have Sha Qi (杀气 , Killing Qi) – a fierce mental intention to kill or hurt – to go right through the opponent. This is different from the concept of Yi, which constitutes the physical nervous-muscular manifestation of what the mind thinks, rather than just what you psychologically aspire to do. One might be surprised as to how far this misunderstanding can go. I have personally witnessed western Xing Yi Quan teachers, and read material written by such teachers, who have fallen victim to this fallacy. When translating the "Yi" in "Xing Yi" to English, they appropriately called it "Intention". Unfortunately, since they did not receive complete training, they perceived this "intention" to be the so called "mental commitment to fighting", while the original name of the art meant something else entirely. Spreading this mistake far and wide, I fear that it had become the predominant interpretation of Yi in the West. Another misunderstanding has to do with the confusion of many teachers who can feel and teach the use of Yi, but mistakenly refer to it as Qi (Chi / Ki). Even within the theory of traditional Chinese Medicine, these two are not the same. The Yi is not Qi(95), and Qi is not what one should try to manipulate directly with Internal Methods. Failing to understand this can be hazardous. I know that certain teachers order their students to use imagery like in Yi training, to try and guide Qi through the body's meridians. Without getting into a physiological explanation of what this may cause and how, you ought to know that this sort of practice can be dangerous to one's health. One should not try to consciously manipulate normal processes and functions within the body without extensive knowledge of medical theories. The methods contained in the Internally-oriented arts are usually meant to bring about health-benefits as a side-effect of correct practice, and not to initiate profound changes in the body by directly changing the way it works (unlike other, more esoteric practices from the Orient). Such methods for bodily-control and change, when they do exists in the curriculum of an Internally-oriented art, are only taught to a selected few who possess the knowledge of how to reverse and correct possible bad outcomes resulting from their practice. People also often have a hard time understanding the difference between Intent (Yi) and Structure (Xing). This confusion may be especially evident following my explanation of Zhan Zhuang and Shi Li, which are methods that were said to develop these two attributes together. My teacher Nitzan once explained the difference in a way I personally found to be satisfying. He said: "You may think of Yi (Intent) as something related to the field of Physiology (as it is the thought-process as manifested in the internal minute-workings of our body), while the Xing (Structure) has more to do with bio-mechanics" (as developing the Structure is, like Biomechanics, "the study of the structure and function of biological systems by means of the methods of mechanics"(73), to produce martial or health related results). Yi should be, in my opinion, the first measure for putting an ‘Internal’ martial arts teacher to the test. A person who defines himself as such should be aware of the term, or at the least be able to feel it and understand how it impacts his or her training. Yi is the cornerstone of all theory in the Internally-oriented arts. Without it, one cannot call his practice "Internal", as he or she will not possess a truly "internal" structure, and be lacking of a key element required for training such a structure. In the picture: A good cup of coffee. 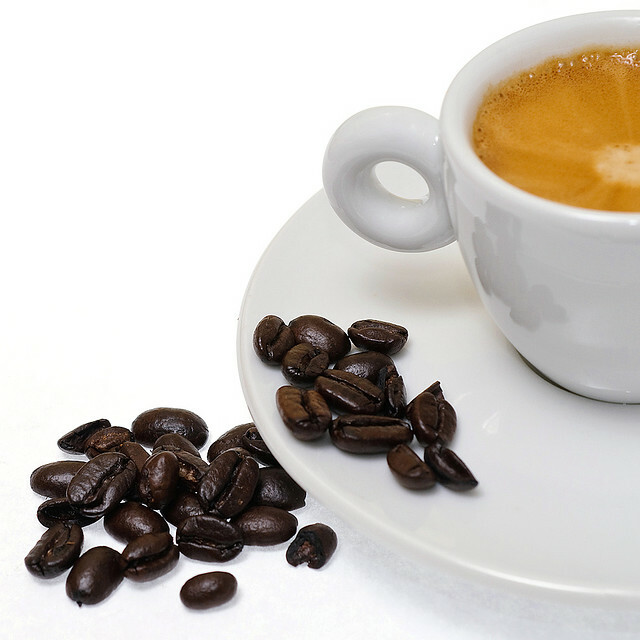 Isn't it just an empty useless vessel without the coffee? The philosophy behind these methods of training isn't new – it was already contained within the main canon of the Daoist philosophy – the Dao De Jing 42, which dates back to the 6th century BC: "The thirty spokes unite in the one nave; but it is on the empty space (for the axle), that the use of the wheel depends. Clay is fashioned into vessels; but it is on their empty hollowness that their use depends. The door and windows are cut out (from the walls) to form an apartment; but it is on the empty space (within), that its use depends…". * Guided-imagery and motor-imagery are in themselves valid methods which are commonly used in sports and rehabilitative medicine, and also by various martial artists when not actively training. They are, however, not the same as using the Yi. While using the thought to imagine physical actions can greatly influence the brain, and even create actual learning and improve one's skills to a degree, it remains in the realm of the mind, and doesn't dross over much into the rest of body – at least not to the same extent that training the Yi does. ** These sensors and receptors are (133, 148): The Golgi tendon organs, which respond to muscular contractions, the Pacini endings, which measure pressure changes and vibrations and provide proprioceptive feedback, the Ruffini endings, that inform the central nervous system of shear forces in soft tissues, and the Interstitial nerve-endings, that can report on all of these, and pain as well (also see142 for similar references). It has been suggested in research (149) that the Golgi tendon organs are extremely sensitive to muscular contractions, which in turn cause them to trigger muscular relaxation. The Pacini receptors in the fascia are, as explained, important for our responsiveness and sense of Proprioception. I hypothesize, following those conclusions, that we can assume that part of the mechanism of for employing small and rapid muscular contractions in the practice of Zhan Zhuang, is for training these receptors to become more sensitive to pressures, and in turn increase sensitivity to the opponent. The order of action by which this mechanism might be applied in real life can be understood via the following examples: The opponent pushes against my limb >>> I begin to stiffen, but because my tendon-organs are sensitive, they enable me to relax the muscles without the onset of significant muscular contraction >>> This in turn enables me to be more flowing and responsive, instead of being stiff and becoming stuck in place. *** Yu Yongnian have written (156, p.69) the following: "By maintaining the muscle at a specific length, by usage of an isometric exercise, the muscles will develop a fast twitch response. This means, first, that the nerves and muscles develop the memory to accelerate instantly to the contraction point of the isometric exercise, and secondly, the fast twitch muscle-fibers are conditioned to maximize the speed of the muscle-contraction". In other words – he argued, among other things, that the postures held with Zhan Zhuang practice teach the body how to accelerate itself very quickly into these posture when needed, through the process of the muscles becoming adapt at contracting at specific angles. This logic, in my opinion, can also be applied to the static postures held by Externalists. The numbers within brackets () are in the book super-script references for the lengthy bibliography. Sure, a 'new' thing. So new it's in the name of Xin Yi Liu He Quan, Xing Yi Quan, Yi Quan, etc. Actually, usage of the term in the practice of martial arts goes back at least several hundred years (not just in these three arts), and in Daoist methods - possibly thousands of years. Why is it not explained in books? Exactly because it's the most important component. I have explained this in the article and the rest of my book. It is not that Yi is the only thing that makes 'Internal mechanics' work. Far from it. Countless others things elements operate simultaneously, and they are all explained in the book. However, without knowing the correct usage of Yi for each movement and practice, they will be no development of proper bodily structure as sought after in a given art. By that guy, you know... Sun Lutang :D Indeed, Yi is not that important... It's just the second character in the title of the book. That is making my point, by the way. This is what people do not understand. The art is called 'The First of Form (Xing) and Intention (Yi) exactly because Xing and Yi are its core component, inseparable from each other. Both beg equal care and emphasis. However, many do not understand Yi and how it is trained, which is partly the reason I have written the chapter about it in my book that is the article above. Historically, the creation of Yi Quan (Da Cheng Quan) by Wang Xiangzhai was partly a reaction of his to what he thought was people's misunderstanding of the training of Yi, and his disappointment that his Xing Yi students focused too much on the Xing. He considered the training of Yi to be the 'higher level' of practice, and therefore based its entire art on Yi training methods. “1. Above and below coordinate with each other. Hands and feet look after each other. Inside and outside are as one. “2. Neither reaching nor separating, neither coming away nor crashing in, neither under-involved nor over-involved. - "...I saw mountains as mountains, and rivers as rivers. When I arrived at a more intimate knowledge, I came to the point where I saw that mountains are not mountains, and rivers are not rivers. But now that I have got its very substance I am at rest. For it's just that I see mountains once again as mountains, and rivers once again as rivers". - A man that comes into the world with the mind of a baby, becomes an adult, then exists with a mature mind that regains the essence of a newborn. Indeed, master Sun's friend recognizes that Sun's observation is found in Buddhism, and comments on his third point by saying: "Being without boxing and without intention – this is the ‘non-identity’ of the Buddhists". - Yi is nothing new. - The training of Yi is essential for the practice of the Internally-oriented martial arts. - Yi is sometimes called other names when taught, the name is not exclusive and neither are the method of training it. - Those who have not been taught how to train their Yi (as explained in the article) tend to dismiss this concept because they are not familiar with it. - In my teachings and those I have received in both Xing Yi Quan and Jook Lum Southern Mantis, without the training of Yi the art would be useless. This statement I have found true in the teachings of all highly regarded martial artists I have come across, among them teachers Chen Zhonghua, Yang Hai, Strider Clark, James Cama (RIP) and Neil Ripsky whom I have interviewed for my book. They all spoke of it (in their interviews, too), and from some of them I have received such teachings personally. This subect is drowning in people who 'know the truth'. But don't. Unfortunately, this article is one of them, and not even close to real insight. No concept in Chinese has one meaning, philisophical concepts even less so. It's in the nature of the philosophy that the same concept has multiple levels of meaning, all of which are dependent on where an individual is at in their understanding. This in itself represents one of the complex and multi-faceted meanings of 'internal': i.e. that, as Wang Xiang Zhai said, you proceed via intuition. Intuitive exploration of wushu means that what we think of as 'styles' are just empty shells - they have no meaning without coming alive via interaction with a living being, whose level is dependent upon an iteraction between self, body, physical training and an intuitive understanding of the principles of wushu. Everything else is superficial. 'Internal' method means that you already know wushu - it's a feature of human beings because it's natural. You can't learn it - you can only unnfold it, through multiple means. Most of what is written in this artice is just another meaningless set of trivia that doesn't even come close to understanding the intuitive method. This is why almost everyone who calls themselves an internal stylist is hopeless as a martial artist, and so has to rely on hubris and fraud. But of course, everyone will say such about their own trivial interpretations... the only difference is that everyone already knows that what I've written here is true - everything else is just a negotiation of the ego, that wanted all the BS much much more than it wanted real knowledge of wushu. Which is why they all ended up as useless larpers. The real meaning was always the simplest idea, with the most profound implications. Obviously. Good luck with your best seller. Thank you for writing and sharing this. I appreciate your research, study, and analysis. From my own experience, I recognize how difficult it is to describe this type of practice (and phenomenon). I plan to purchase your book when I return to the USA and have a chance to read it. Thanks for visiting! Don’t be a stranger.